As we wind down the harvest for 2014, orders are already headed to trusted organic seed suppliers to guarantee the quality, heirloom organic non-GMO selections you trust me to grow. I am very, very excited about our debut garlic crop going in during the next few weeks that will become a specialty addition to our 2015 CSA. Thank you to Geno and Lorna who made it possible (by reserving their share immediately!!) to purchase bulbs in time for fall planting. Such excitement as beds get tilled up and prepared with plenty of leaves and grass clippings to welcome the first crop at Grateful Plains. For 2015, there will be 5 varieties available chosen to provide a wide range of use such as ‘best roasted’ , ‘best raw’ and ‘best for storage’ characteristics of garlic that is ideal for growing in our region. ‘Silver White’ (Silverskin softneck variety) has been selected for its familiarity, the most ommon type found commercially, though, of course, our bulbs are certified organic from Filaree garlic farm. The taste is sharp when eaten raw and might become gorgeous garlic braids should the harvest prove prolific in June. ‘Music’ (porcelain hardneck variety) is a type I selected mostly because of its name. I do that a lot. Music therapy is key to vibrational healing, a mainstay in my healing arts studio, EnergyPsi. Importantly, this variety is also renowned for its sweet, pungent flavor. Hot when eaten raw but mild when roasted, Music is an Italian variety brought back to Canada by Al Music in the 1980s from his homeland. 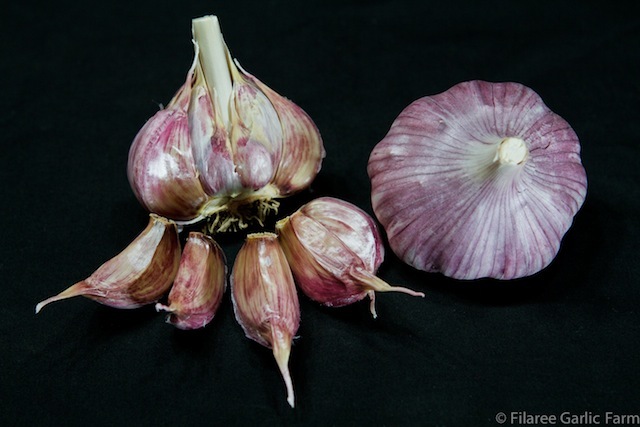 ‘Chesnok Red’ (standard purple stripe hardneck variety) has been selected for its ‘best baking garlic’ taste tests conducted by Rodale, Sunset Magazine, Martha Stewart and others. Its medium heat and flavor when eaten raw and its large easy to peel cloves makes this an excellent selection for our first attempt at cultivating red garlic. Originally from Shvelisi, Republic of Georgia. Asian Tempest (artichoke hardneck variety) is my personal pick for large bulbs. I simply cannot get enough garlic and don’t like to waste the time peeling a bunch of individual cloves. This bulb has only five cloves per bulb packing a sweetness with a bit of a baked sweet garden pepper flavor to it. It’s a variety originally from South Korea and is positively wonderful in baked dishes.